Just back from a wonderful holiday in New York City and wanted to share a brass plaque that is part of the Library of New York's Library Walk. 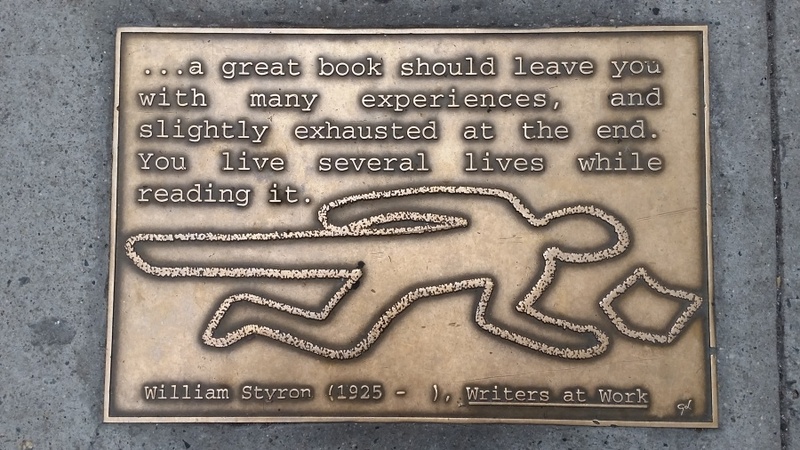 The walk is a celebration of the world's great literature and features inspirational quotes about reading, writing and literature on brass plaques set into the footpath on 41st Street, Manhattan, between Fifth and Park Avenue. We walked its length after visiting the library, which you have a perfect view of as you walk up the street from Grand Central Station. The 96 plaques were sculptured by Gregg LeFevre, a Greenwich Village sculptor, and the writers of the quotes include Mark Twain and Dylan Thomas, to name just two. Eyecatching artwork illustrates their words. We really enjoyed our wander along the path, stopping to read the plaques that are set at regular intervals on either side of the street. Wouldn't it be fabulous if some of our New Zealand libraries did something similar to celebrate New Zealand books, writers, poets, and literature?